Director Michael Bay (The Rock) brings together a star studded cast in The Island which stars the multiple talented Ewan McGregor and the equally talented and majestically beautiful Scarlett Johansson in this futuristic tale that contains so many twists and turns, it will leave you on a true roller coaster ride. For a science fiction movie, The Island is quite intelligent and adds in a variety of moralistic issues and norms of society and at times seems like a dark mirror of the future. At first, it seems that mankind is limited to an island in the middle of nowhere with everyone in the complex wearing white. Unbeknown to its inhabitants, all these people are clones who are awaiting for their number to be called which promises them freedom, whereas they are taken away for human cultivation for their body parts. The people in this complex are banned for relationships in order to keep their clones pure, however when Lincoln Six Echo (McGregor) and Jordan Two Delta (Johanssen) form a bond which is about to broken, they soon become aware to a much larger world than they previous knew existed. 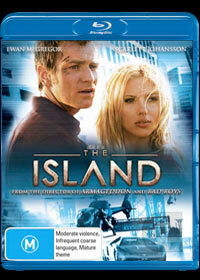 Match that with some state of the art special effects, The Island is definitely an impressive science fiction that is not your standard Hollywood dribble but rather an impressive pieced movie about the future, relationships and the unknown. The video quality of the movie is amazing and is easily one of the best Blu-ray discs that I have seen. Early on in the movie, the colours are quite vibrant that compliments the extremely sharp picture quality. The detail of both McGregor and Johanssen is quite exceptional and at times you can clearly make out all their flaws and skin tones, not they these two Hollywood greats have too many flaws. The audio is great for The Island and wisely uses the surround sound system perfectly which assists in the overall immersiveness and enjoyment of this title. In conclusion, The Island is definitely a great modern science fiction movie that we could recommend to both fans of science fiction and even non-science fiction fans as the story is quite realistic and even probably at times. Match that with the quality of Blu-ray and seeing both McGregor and Johanssen is a pure treat.